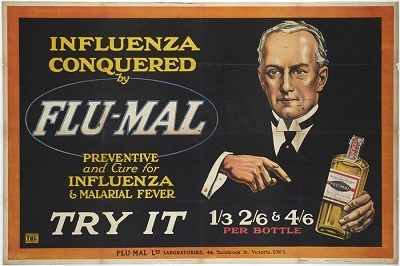 One hundred years after the outbreak of the deadliest wave of ‘Spanish Flu’, an epidemic that killed 5% of the world’s population, the Museum of London in a new display will look to the future for the next unknown lethal disease that might hit us and explore the deadly epidemics of past centuries. This year, the World Health Organisation declared an unknown pathogen (micro-organism causing disease), they have named ‘Disease X’, one of the great potential risks to life and a top priority for research. The next international health crisis may be caused by something unknown to doctors and with no known cure. In the early 1890s, the ‘Russian Flu’ epidemic killed a million people across Europe. Among the victims was a man whose demise changed the course of history, threw Britain into a state of shocked mourning and created major public awareness of the danger that had been visited upon the country. Prince Albert Victor known as Prince Eddy, brother of the future King George V and grandson of the reigning monarch, Queen Victoria, was second in line to the throne. In January 1892, shortly after his 28th birthday, Prince Eddy was hit by influenza, developed pneumonia and died at Sandringham. His sudden death, when apparently fit and healthy, shocked the nation. It became brutally clear that nobody was immune to the threat of Russian Flu. The fact that Russian Flu would strike down people across society, caused widespread alarm. Among the key exhibits in the new display will be the outfit worn by Queen Victoria in the very earliest period of mourning for her grandson. Never previously displayed in public, the outfit features a thick band of black crepe, designed to display the depth of the Queen’s sadness. By londonvisitors2014 in Exhibitions on November 7, 2018 .